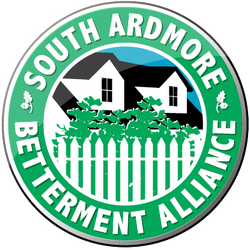 Welcome to the South Ardmore Betterment Alliance! In 2001, a developer approached our neighborhood with a plan to build 16 townhouses on the block bordered by Cricket Avenue, Normandy Road, and Oakford Road. At the time, that block was known as The Recchutti Property because of the family that owned it for many years. The community did not support over-development in an already full neighborhood, and on a patch of land that is flood-prone. A group of neighbors banded together to oppose this development, and the South Ardmore Betterment Alliance (SABA) was formed. SABA worked closely with township officials in presenting the case to preserve the property as open space through eminent domain. Crucial pieces of evidence that informed this decision included: historic maps showing a pond on the property, the culverting of what was once open creeks that continue to feed into the Cobbs Creek watershed, annual flooding downstream of the property causing sewage problems for neighbors on Oakford and St. Marys, and water percolation tests. Preserving this land as open space not only benefited the immediate neighborhood, but also helps maintain the ecological health of the Cobbs Creek watershed. Over the years, the mission of SABA has remained consistent: to maintain and enhance the quality of life in our community. With that in mind, SABA has organized many events over the years to bring neighbors together and increase the connection and sense of community we all have. These events have included opportunities to join together in celebration and fun such as the 4th of July Celebration, a tradition that goes back decades; Halloween Parties with a haunted house; the Easter Egg Hunt; Winter Solstice/Luminaria Nights; and the holiday Cookies, Cider, and Caroling party. Other SABA efforts have been to improve the quality of our neighborhood, such as planting events to improve the landscaping at Normandy Park, purchasing park furniture for Normandy Park, and cleaning up the creek along the bus path. We also started events like the SABA 5k that have raised money for the Jefferson Hospital for Neuroscience and the Elwell Field playground fund. Finally, SABA has tried to address the concerns and interests of the community by organizing town hall meetings with Commissioners and the Police Lieutenant, and by filing or supporting complaints about zoning and codes violations. SABA runs solely due to the efforts of volunteers in our community. Over the years, many people have given their time and energy to SABA’s events and efforts. They have contributed new ideas and perspectives. We are so indebted to those individuals, knowing that they helped simply because they care about the neighborhood and want this to be the best community possible. We hope you take the time to appreciate our community and all that makes it special. We also hope you will consider getting involved with SABA so you can help ensure that ours continues to be the kind of quality neighborhood we all want.